Is a No Plate Crackdown Coming? Are you driving around without plates? A new law might change that. January 1st 2018, California started requiring dealers to put paper plates on every car sold. That meant that February first the grace period for not having plates on your car was over. If you have seen these goofy white paper plates you were probably wondering what they were. Even though it is a small percentage of people who “forget” to put on license plates, they comprise a big percentage of camera tickets. I am betting the big loser is the toll roads. Law makers say that for everyones safety we need license plates on the front and the back. We think that is total bunk, it is all about revenue. The state of California and it’s cities just want to make sure you get those camera speeding tickets, red light tickets and toll fees paid. Without plates, bridges and toll roads are a freebie! Last year I wrote about the no front plate crackdown. Now it looks like the no plate crackdown is next. 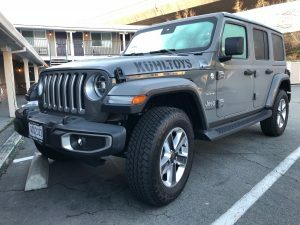 This week I picked up the new 2019 Jeep JL for KühlToys. Even though it is primarily a show vehicle the dealer still screwed the paper plates on. The Jeep specialist said it is a requirement and he has to sign an affidavit saying he did so. He even took a picture in case I took them off! Since we had the new California paper license plates and there were record snows coming to the Sierra’s we hit the road for our first test. Now we know why they offer a “Selectrac” AWD in the Wrangler series. When in 4wd, this thing does not like to turn, especially into parking spaces that were recently plowed. In two feet of powder it goes like a rabbit running from a fox. At the end of the day though we could see the paper plates being the end of no front plates or hiding behind the new car tag in the window. As I always say, “follow the money and the truth will become clear”. Back to the paper plates and running around with no plates. It is clear the no plate crackdown is coming. The toll roads tried to solve the problem of no plates by requiring a transponder. That really didn’t do much since there is rarely an officer at the toll station ready to chase you down for not having one. If you are running around without plates, be prepared to meet your local law enforcement soon and open up your wallet. Next Topic: Does CBD Help With Yoga?